SamuiBus.com | Book Airport transfer to Lamai in just a few minutes! Lamai Beach is large sandy beach about 3 miles in length. 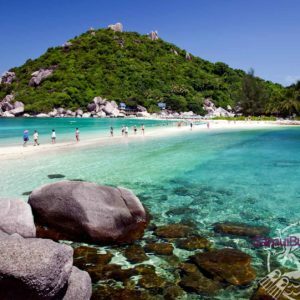 By popularity and population Lamai Beach is second beach after its neighbor Chaweng. However, the atmosphere in this area is a bit different: the tide of life is more quiet and measured. Night entertainment like a go-go bars are exist but not so obsessive. Hotels on Lamai beach have offers at affordable prices. The southern third of the beach has the widest strip of sand, is the best for swimming, and has the most nearby eating and drinking and shopping options. To the north, the water doesn’t get deep enough for swimming until you’re quite some distance out, and the further north you go, the narrower and quieter the beach becomes, eventually becoming rocky towards the headland. There is a significant number of girlie bars along the main street as well as in some side streets. They are most prevalent in the southern part of town, while the northern part is virtually free of them. The south of Lamai, once you get past the Muslim Fishing village Hua Thanon, is Samui before becoming the popular tourist destination it is now. It gives you a view of lush greenery, livestock grazing in the fields, and little roadside cafes selling drinks and Thai dishes. Between Lamai and Hua Thanon lies two famous rock formations: Hin Ta and Hin Yai also known as Grandpa and Grandma rocks. These formations look like the male and female genitalia, respectively. What makes these rocks even more strange is that they are close to each other, giving way to a legend explaining how they came to be. Get from the Koh Samui Airport to the hotel in Lamai Beach and back will be so easy if you will think about it in advance. Just book Transfer service!